At the eleventh hour of the eleventh day of the eleventh month. At this time of year, in Britain, there are an awful lot of poppies in evidence on the coats and jackets of the great and the good. Also on many of the not so great. Possibly, too, many of the less than good. This is the beginning of a poem by Canadian soldier and medical officer John McCrae. It was written in May 1915, soon after he had conducted the burial of a fellow soldier killed during the Second Battle of Ypres (April-May 1915). He was, no doubt, expecting the arrival of more wounded at the field hospital he commanded. Anticipating also there would soon be more graves. It captures some commonly observed sights in war-torn Belgium: the sunset, the larks, the fields of flowering poppies. 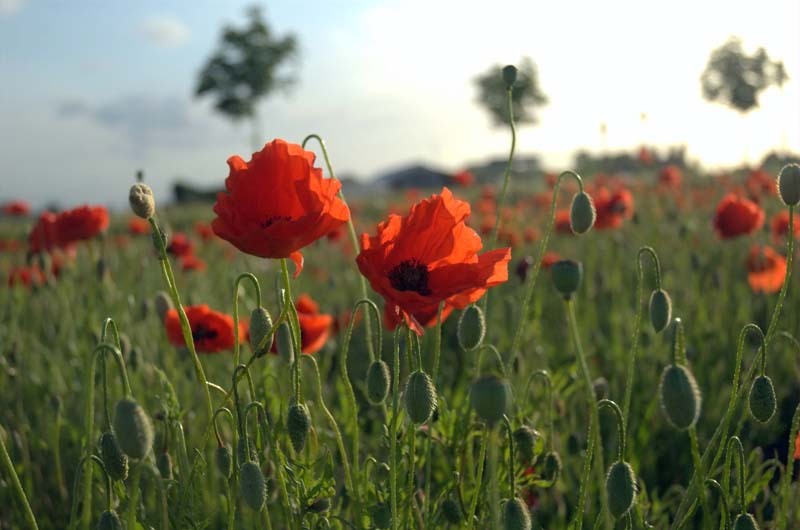 Wikipedia says Due to the extent of ground disturbance in warfare during World War I, corn poppies bloomed between the trench lines and no man’s lands on the Western front. I’m no gardener, but this seems reasonable. Still, there’s no supporting reference. I found some corroboration on a seed and gardening website. Wildseed.co.uk says poppy seeds can lie dormant for decades waiting for a suitable opening … so it was around the battlefields of the Western Front that poppies sprung up and bloomed in profusion in a landscape cultivated not by ploughs but on soil laid bare by explosive shells and mines. John McCrae wasn’t alone as a soldier on the Western Front in observing how some aspects of nature carried on regardless, despite the carnage. The poems of the war poets and soldiers’ memoirs are scattered with similar references. The poppies, the larks, the sunset. Nature’s indifference to man’s concerns, once observed, may become symbolic. McCrae’s poem was a big hit, published first in Punch in Britain, then elsewhere, translated, anthologised and quoted. No doubt the final verse helped things along. And then there’s that implied threat: if you don’t fight on We shall not sleep but come back and haunt you. It’s no wonder that for a period at least the last verse was often left out when the poem was re-printed. At the very end of the war an American academic, Moina Michael, inspired by “Flanders Fields”, took to wearing a red poppy to commemorate the war dead. (She’s the one who wrote We caught the torch… above.) She managed to persuade American and, with the help of Frenchwoman Anna Guérin, French and British people to adopt the poppy as a symbol of remembrance and, more importantly, as an an object to be made and sold to draw in funds for war veterans. This was sadly needed. Many soldiers died in the war. One estimate puts the British Empire dead at a little under 10 million soldiers. But twice that number, about 20 million, survived with wounds of various degrees of seriousness. Charitable organisations – in Britain Field Marshal Lord Haig’s British Legion (later the Royal British Legion) – took up Michael’s idea of making and selling poppies. They are still doing it today. I think they protest too much. 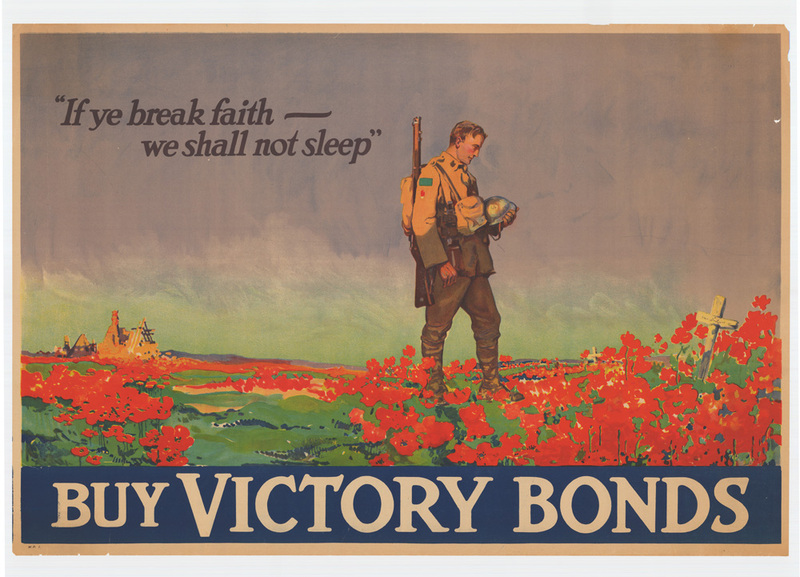 Yes, the poppies are a symbol of remembrance, but hope? For what? For an end to war perhaps? But the Royal British Legion doesn’t make a great effort to link its poppies to the wastefulness and horror of war. On another page I read: The First World War is infamous for the number of lives it cost, however … [i]t also laid the foundations of British Remembrance… So WW1 is a good thing because it gave us something to remember? And on the current front page: The Royal British Legion led the nation in saying Thank You to the First World War generation, all who served, sacrificed and changed our world. 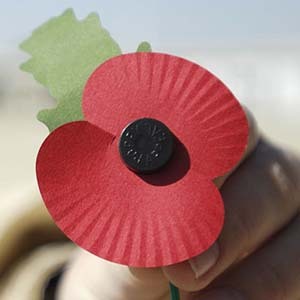 So, let’s wear poppies to say thank you to The Dead for taking up the quarrel with the foe? And yes, poppies are worn by millions every year. In Britain at least the social pressure on people who choose not to wear one is very heavy. The Royal British Legion may not want that to be a reflection of politics and religion, but it feels an awful lot as though it is. Especially when you see the British establishment, poppy-decorated and out in force. And of course the poppy is a symbol of death. I don’t think McCrae intended that in his poem. Not at all. In “In Flanders Fields” the living poppies are contrasted with the crosses marking the graves of the dead. The poppies blow / Between the crosses… But here we are, 103 years on and everyone involved in the First World War is now dead. 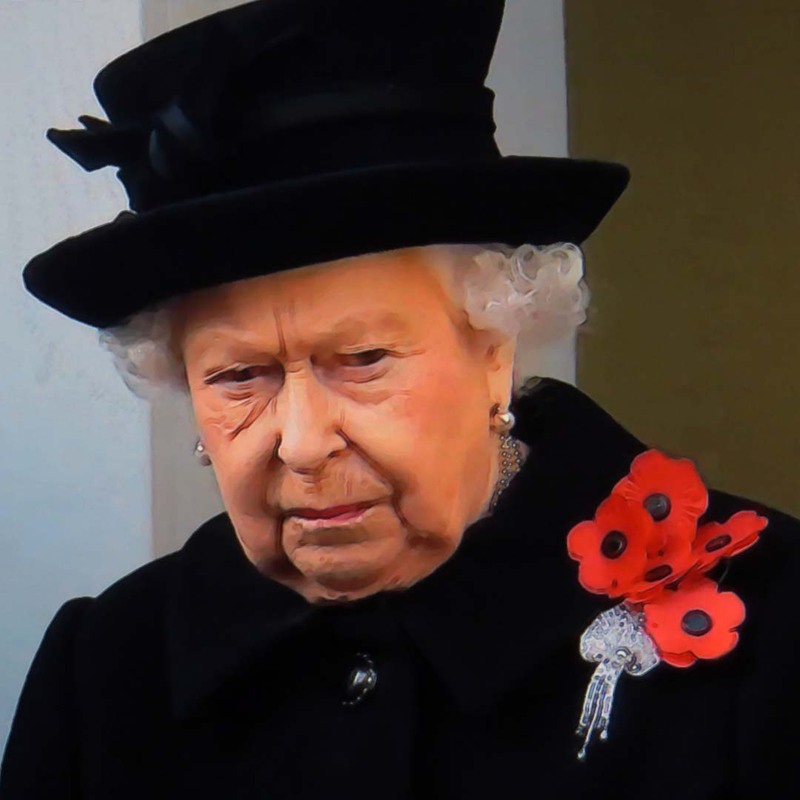 Whatever the Royal British Legion wants the poppies to mean, those who wear them are very likely thinking about dead people. So, like it or not, that’s part of what they symbolise. Finally, yes, field poppies are red. As red as blood. You can’t divorce the colour from the notion of blood just because you find it distasteful. Of course one might choose to wear a white poppy. They’re mentioned as an option in that BBC article. All these criticisms of the red Royal British Legion poppies were already current early on. In 1933 the Co-operative Women’s Guild started producing white poppies as an alternative symbol of remembrance. These were intended to commemorate all the dead in all wars. Not just the British dead, not just the military dead. Nowadays white poppies are produced and sold by the Peace Pledge Union. Perhaps in the wake of all the business of WW1 commemoration the PPU’s website includes a link to another website, The Men Who Said No. 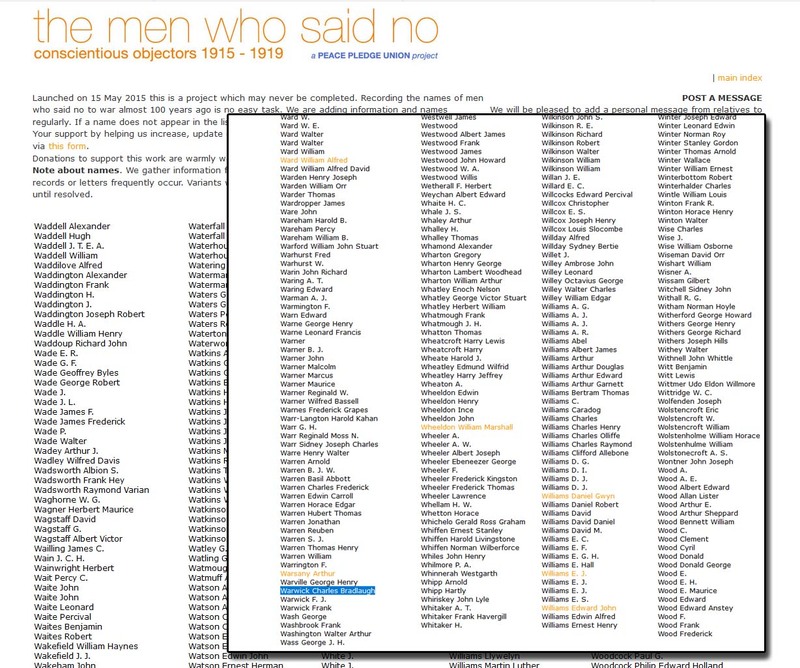 This site sets out to list the First World War’s British Conscientious Objectors. The COs were the men, called up to the military during the latter part of WW1, who refused to fight. I feel I should add that I’ve been struggling to find a way to write about this since Sunday. Since Remembrance Day in fact. I broke out all my war poetry books and a couple of books of memoirs and then spent an inordinate amount of time on-line. I started twice and twice threw away what I’d written as tosh. The above may be open to the same criticism, but I’ll let it stand. At least it’s better than the earlier drafts. Header image: collage of still photos taken from the TV, from a variety of video news reports in the period around early November 2018 . The illustration of Queen Elizabeth II with her spray of poppies broach is made from a still photo taken of a TV screen. News film footage of the 2018 Remembrance Day at the Cenotaph in Whitehall, London. Oerhört intressant. Jag har alltid undrat varför engelsmännen bär de röda pappersblommorna. Tack! Grendel is disappointed in his new neighbour, Rothgar. The feasting and noise night after night is too much... and Grendel's Dame is unhappy. Grendel has to act!